When it comes to journeys in life, some things you have to embark on at the exact right time. Whether it be making a big move, changing careers, becoming more fit, or even, reading a new book. In past posts I have documented my struggles with depression and anxiety over the years, and during this time, I always had the idea in the back of my mind that I had to switch focus, and actively walk in the path to healing. I have had an interest in self-help books for some time now because I have always found the knowledge of experts to be helpful when friends or loved ones could not always help. Suggested by my good friend Moeima, You Can Heal Your Life is one such book. Written by self-help guru Louise Hay and published by her imprint Hay House, You Can Heal Your Life is one of those books I was told you have to be ready to read, and it’s true. I originally purchased the book in the earlier part of the year, and became quite frustrated with its format. It was not an easy read by any means, as it was set up as more of a workbook. Louise discusses different topics by chapter, begins and ends each chapter with affirmations, and asks questions throughout that the reader is to answer either within the pages of the book, or on a pad of paper. In the early part of the year, I was not ready to do this, but once I began therapy over a month ago, I knew jumping back into the book would be imperative to my healing. I brought it with me wherever I would go, on my subway trips to and from the city, reading intently and voicing all affirmations in my head. It felt so easy at this time, because my timing was finally right, I could apply lessons and teachings through a clear lens, without the disruption of negative thoughts. Throughout the book Hay reiterates the importance of positive affirmations and truly loving the self in all forms, from the foods you eat, the way you speak of yourself, and the way you present yourself to the world. Reading more about these teachings made me realize that I may have great ideas for and about myself, but that it is imperative that I truly believe it all, and share it with those in the world around me. 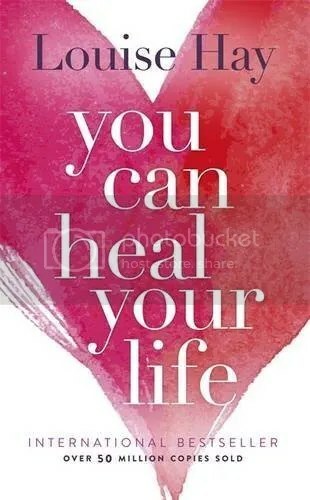 If you are in a rut and willing to actively walk on the road to healing, I would definitely suggest reading You Can Heal Your Life. It will not be the easiest read, and it makes you stop and analyze many aspects of your life, but at the very least, it will help you gain practices to truly love every bit of yourself. Available at Hay House and other fine book retailers.